We are pleased to present our list of the Top 30 Coffees of 2016, Coffee Review’s fourth annual ranking of the most exciting coffees we reviewed over the course of the past year. In 2016, we cupped thousands of samples and published nearly 400 coffee reviews. Approximately 90 of the reviewed coffees scored 94 points or higher. Obviously, all coffees earning scores of 94 points or more are exceptional, but we couldn’t include of all of them in the Top 30. Some were more exciting or noteworthy or better values than others. Consequently, some outstanding coffees were left off the list. However, every coffee included in the ranking is remarkable or exciting is some way. Our rankings often feature a significant number of high-scoring coffees produced from botanical varieties of Arabica with striking sensory properties, such as coffees of the Gesha/Geisha variety and coffees from distinctive traditional varieties grown in Ethiopia and Kenya. Continuing a practice we began last year, we have created a separate list of superlative coffees in ten categories, including South American coffees, espresso blends and darker roasts. The goal of the category rankings is to provide recognition for fine coffees from less celebrated origins and/or produced from more common botanical varieties. 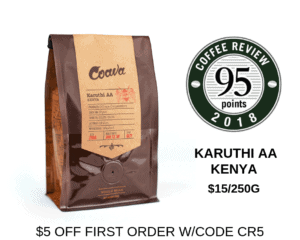 Many of the coffees in the Category Rankings did not attract exceptional ratings of 95 points or more, but they nonetheless merit recognition for their excellence. For those who are curious about why coffees from certain tree varieties tend to score better than coffees from other tree varieties, or are generally interested in how we conduct our testing and rating processes at Coffee Review, see Editor Kenneth Davids’ piece, How Coffee Review Works. The average overall rating of the coffees on the Top 30 list for 2016 is 95.0 out of a possible 100, slightly higher than the 94.8 average in 2015 and 2014 and the 94.4 average in 2013. One can’t directly compare the price of Top 30 coffees from year to year because the mix of coffees varies too dramatically. That said, the average price of coffees on the 2016 Top 30 list is US $36.61 per pound, which is roughly in line with past years. It is down nearly four US dollars from the US $40.33 average in 2015. It is nearly the same as the average of US $37.98 in 2014 and US $35.00 in 2013. The higher average price in 2015 was largely skewed by the six examples of the rare and expensive Gesha variety on the 2015 list, as opposed to three or four Geshas in other years. This year’s No. 1 coffee is a Kenya Guama Peaberry roasted by Bird Rock Coffee Roasters in San Diego, California. Cited as “An exuberant expression of the classic Kenya cup … deeply sweet, sumptuous, … laden with berry and spicy floral suggestions,” it earned 97 points (out of a possible 100). For the fourth year in a row, our top coffee of the year is a single-origin coffee. However, it is the first time a coffee from Kenya has topped our list. In 2014 and 2015, a coffee from Panama was named the top coffee of the year; in 2013, the No.1 coffee was from Ethiopia. Three of the Top 30 coffees in 2016 come from trees of the Gesha variety, a rare Ethiopia-derived botanical variety of Arabica with elongated beans and a distinctive floral- and cocoa-toned cup. Two of the three Geshas were from farms in Panama. Coffees appearing on the list were grown in eleven different countries. The most frequently appearing origin is Kenya, with seven coffees on the list. Other origins with multiple coffees on the list are Ethiopia (6), Sumatra (4), Panama (3), Hawaii (2), and Brazil (2). Given that Coffee Review’s tasting facilities are based in the United States, where nearly 70 percent of our readership resides, it is not surprising that 26 of the 30 coffees on the list were roasted by companies in the United States. Roasters from 12 U.S. states were represented. California roasters dominated the rankings this year, with seven representatives overall. Coffees roasted by companies in Taiwan, South Korea and Australia also appear on the list. Regular Coffee Review readers will recognize many of the roasters appearing on the Top 30 list. Six roasters had two coffees on the 2016 Top 30 list: Bird Rock Coffee Roasters, Dragonfly Coffee, Hula Daddy, JBC Coffee, Temple Coffee, and Willoughby’s Coffee & Tea. All six of these roasters are Coffee Review advertisers, although their status as advertisers had no bearing on their review ratings or their selection to the Top 30. We cup all coffees blind, identified by number only. We do this consistently and rigorously. It is not advertising that leads to consistently high ratings, but rather consistently high ratings often lead companies to become advertisers, presumably to further capitalize on the success of their coffees. The variety of tree that produced each coffee on this list appears to play a crucial role in producing superlative coffees. Based on information provided by roasters, in 2016, five coffees come from the heirloom, Bourbon-related SL28 and SL34 varieties responsible for the finest coffees of Kenya. Three coffees come from the rare and celebrated Gesha variety. Two coffees were produced from trees of the rare, big-beaned Pacamara variety. In addition, one coffee on the list comes from the tiny-beaned, but even rarer Mokka variety. Two are from the revered heirloom Bourbon variety of Arabica. Finally, all six of the Ethiopia coffees on the Top 30 list almost certainly were produced from the unique tree varieties long grown in southern and western Ethiopia. So, in the case of well over half of the Top 30 coffees, distinctive tree variety appears to play an important role in generating an exceptional cup worthy of a high rating. For more on botanical variety and the role it plays in fine coffee see Kenneth Davids’ How Coffee Review Works or our December 2011 tasting report, Single-Variety Coffees: Aficionado Fun. Processing method also appears to play a significant role in qualifying for the Top 30. On this year’s list, for example, at least six coffees were dry- or “natural”-processed, meaning the beans were dried inside the fruit rather than after the fruit has been removed, as is the case with wet-processed or “washed” coffees. Until relatively recently, dry-processing was seldom applied to high-end specialty coffees like those that appear on our Top 30 list. This showing is evidence of the continuing trend toward use of alternative processing methods as creative tools for crafting distinctive cup profiles. The number of coffees intended for espresso brewing modestly increased in the 2016 Top 30. Five espressos appear on this year’s list, four of which are single-origin coffees. That’s up from four espressos in 2015 and one and two in 2014 and 2013, respectively. Perhaps this result is a small confirmation what appears to be a general trend toward more production of refined, carefully profiled single-origin espressos in preference to blends among leading roasting companies. The absence of certain types of coffees from the Top 30 list is also notable. Despite our efforts to recruit quality dark roasts and decaffeinated coffee samples to review, we did not turn up a single 90-point decaf. We did test a handful of decaffeinated coffees that scored 88 or 89, but none seemed worthy of recognition in the special decaffeinated category ranking, which we had initially planned but reluctantly dropped for 2016. While we do offer a selection of noteworthy darker roasts (ranging in score from 90-94) in our Category Rankings, none qualifies as a strictly defined dark roast based on Specialty Coffee Association of America terminology. All fall into the category of medium-dark. We are planning a particularly concentrated push in 2017 to surface more darker-roasted coffees that we feel merit relatively high ratings. However, one of the selection criteria for the Top 30 coffees is value or affordability, measured by price per pound. Many of the coffees on the list are priced in line with similar single-origin specialty coffees in the marketplace. Half (15) of the coffees on the list cost less than $25 per pound. Four coffees are priced under $20 per pound, namely: No. 7 Willoughby’s Brazil Fazenda Passeio Natural (94 points; $13.99/16 ounces), No. 19 Crescendo Black Panther Sumatra (South Korea; 94 points; equivalent to $8.54/8.8 ounces), No. 26 Revel Coffee Brazil Estancia Telese (94 points; $13.25/12 ounces), and No. 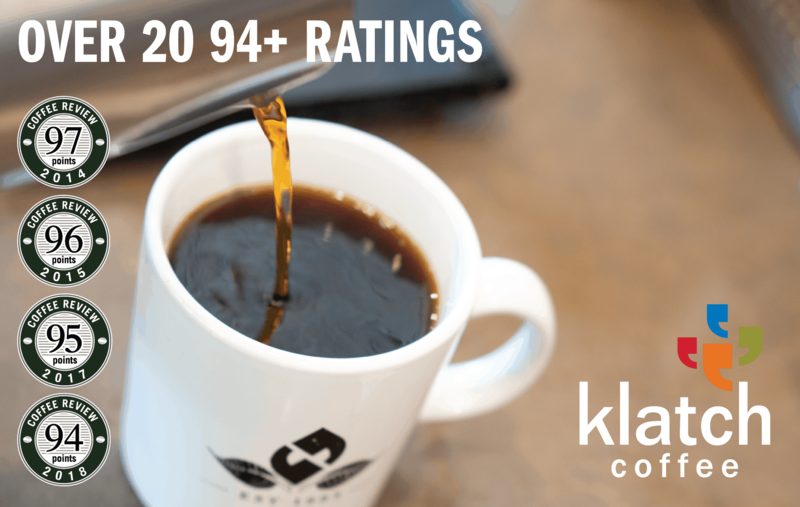 29 Klatch Coffee Sumatra Mutu Batak (94 points; $14.50/12 ounces). At the other end of the price spectrum, four coffees on the list—two Geshas and two Hawaii Konas)—cost more than $75 per pound. We are pleased to share our list of the Top 30 Coffees of 2016.